Zane Grey’s Adventures in Fishing. New York: Harper & Brothers, 1952. First edition, early printing of this posthumous collection of writings regarding fishing. Octavo, original cloth, illustrations from photographs. 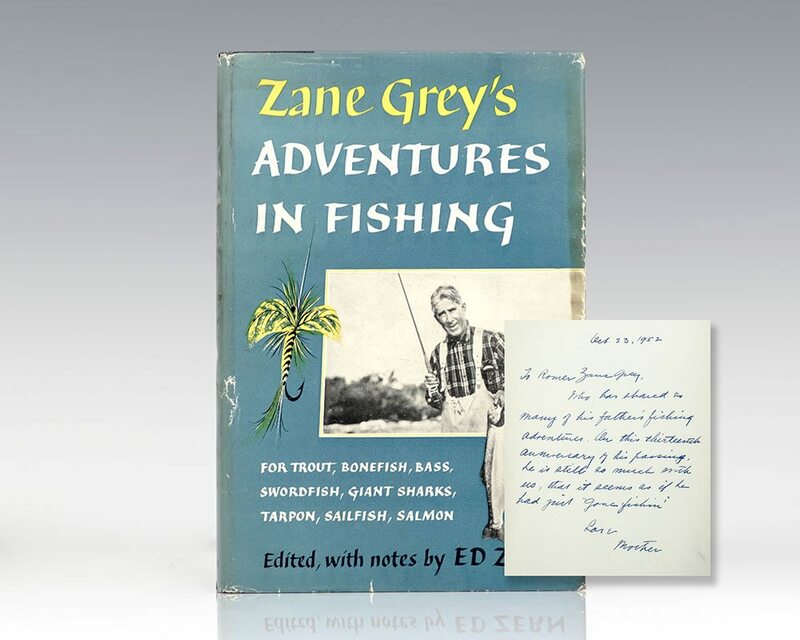 Inscribed on the front free endpaper by Zane Grey’s widow to their oldest son Romer Zane Grey,”To Romer Zane Grey, Who has shares so many of his father’s fishing adventures. On this thirteenth anniversary of his passing, he is still so much with us, that it seems as if he had just ‘gone fishin’. Love Mother.” Near fine in a very good dust jacket. Edited with notes by Ed Zern. A unique example. Best known for his Western novels, Zane Grey was a pioneering angler, a great innovator, and one-time holder of more than a dozen saltwater world records. Just as significant as his fishing accomplishments is the fact that Grey was a superb storyteller who inspired countless anglers the world over with his tales of travels and encounters with fish. As a boy in Zanesville, Ohio, Grey fished for bullhead and bass in the Muskingum River. His first fishing mentor was locally known as "Old Muddy Miser," a man who fired Grey's imagination with tales of trout and salmon and great saltwater fish, which he said no one seemed to go after. Grey would eventually go after them, but not until he'd married, tried dentistry and disliked it, and begun writing after hours. After struggling for some years as a writer, the lean years ended with the 1910 publication of Riders of the Purple Sage, a phenomenal seller that brought Grey fortune and freedom to do what he wanted. Grey fished across the United States and around the world, both salt and freshwater. He was the first man to catch a 1,000 pound fish on rod and reel. He pioneered methods for catching the elusive broadbill swordfish and successfully championed the use of light tackle for sailfish. He was the first to use the "mother boat" concept for keeping his smaller fishing boat supplied without having to return to land. Grey caught snook before other outdoor writers discovered them, he was one of the earliest bonefishermen, one of the first to recognize the great fighting abilities of permit, and was among the first to start taking sailfish in the fertile blue Gulf Stream. With his 190 foot schooner The Fisherman, Grey was among the first to explore sport fishing in Mexico, Central and South America, New Zealand, Australia, and the South Pacific. In 1952, Ed Zern wrote of Grey, "No other man … has devoted so much of his fortune, or so large a share of his time and energy, to the catching of fish for the sport of it."